Blurb: Lucy Brewer would never have guessed that her best friend, Duffy McCready (of McCready’s Bait Shop & Funeral Home) has been in love with her since they were kids. Fear of rejection and his own romantic complications prevented Duffy from confessing his true feelings in high school, so he stood by and watched her wed Wayne Bowman right after high school. Wayne had always been a cheapskate, so it comes as no surprise when he suffers a fatal accident while fixing his own truck. Gimme Some Sugar, yesterday and have been trying to figure out this review ever since. You see, I have loved, adored, been over-the-top about each of the novels in this series until this one. Was it a bad book? By no means. To me, it just felt like it was missing something. Duffy has been one of my favorite characters from the beginning, although his questionable, albeit slightly understandable, interactions with his ex-wife, Lana, raised eyebrows. But Duffy is such a nice guy that I don’t think he could bear anyone feeling bad, even if that anyone is a selfish, despicable creature like Lana. So I was very happy to read Duffy’s book and had actually been looking forward to it. Also, Lucy is a nice addition to the cast of characters, but I didn’t come away loving her the way I had Frankie, Margot, or Marianne. I felt sometimes she didn’t take responsibility for her own actions and her stands balanced out her wishy-washiness so that she seemed blander to me. But, again, after creating characters like Margot and Frankie, sometimes you have to have one that is blander because they all can’t be the same. 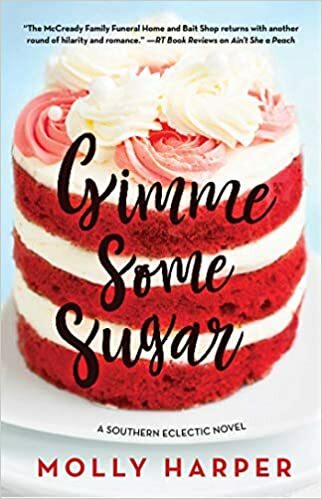 It’s occurred to me that I started reading Gimme Some Sugar right after a book (review coming up in a few days) that had me rolling on the floor laughing and that might have affected my reading. Some of the jokes here felt a little recycled from previous novels in the series in comparison. Gimme Some Sugar is still one of the best books I’ve read this year. It’s fun to visit these characters who I’ve grown to have so much affection for. Every book in this series is like a cure for a bad day. Who will like Gimme Some Sugar? Molly Harper fans, readers of The Southern Eclectic series, readers who enjoy southern fiction with a sense of humor, readers who find the idea of an all-in-one baitshop and mortuary fun, readers who like all of their food deep-fried. I haven’t heard of this series! It sounds great!